Published: Feb. 12, 2014 at 12:29 p.m. Updated: Feb. 13, 2014 at 12:18 p.m. The Cleveland Browns have cleaned house, and you can’t blame them. I mean the previous regime had nearly a year to work its magic and it just didn’t work out. With that in mind, we’d like to take this Throwback Thursday to recognize some one-hit wonders, never would-be players and guys/things we just miss completely. You might have heard a number of people say the NFL stands for "Not For Long." 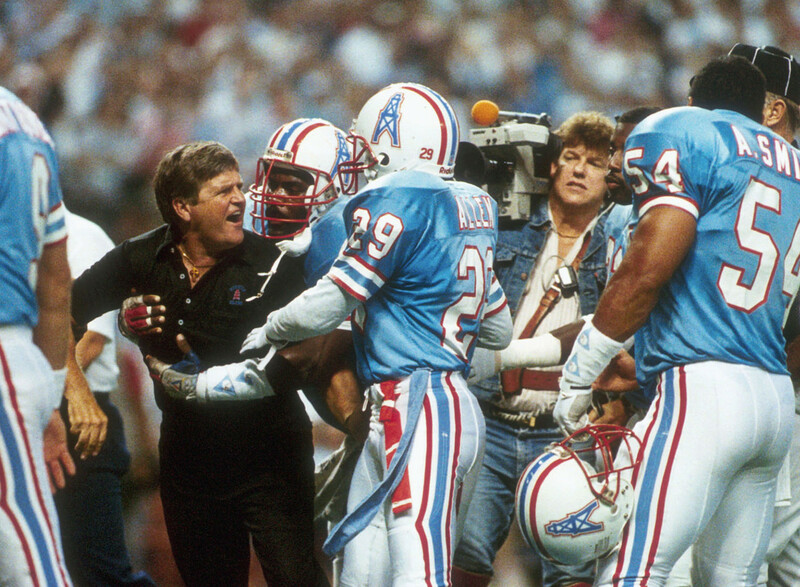 Those words were once made famous by former Falcons coach Jerry Glanville during one of his epic rants captured on NFL Films. Yeah, seems like former coach Chudzinski had to learn that the hard way. But let's remember the good times, Cleveland. Like the time you guys rocked the vote and got Hillis on the cover of Madden '12. There will be a generation of kids years from now who will look back at that cover and believe Hillis was an exceptional NFL player. Speaking of running backs, what happened to the workhorse back? Seems like a thing of the past and we're likely never to see a running back drafted as high as Richardson, who was selected third overall in 2012. Hey Cleveland, at least you pulled off the heist of the year to get a first-round pick for Richardson. Let's take a moment to lament Billy Sims, whose career was cut way too short. You might notice he's wearing Barry Sanders' No. 20. Sanders had no desire to wear No. 20 (he wore No. 21 at Oklahoma State), but he wore it as homage to Sims, at the request of then-coach Wayne Fontes. And if we're going to lament runners who had their careers cut shot, how about a shout-out to our own T.D.? Few running backs had a bigger impact than Davis, who will hopefully get his recognition in Canton, Ohio one day. Yes, I'm biased. Curry was the fourth overall selection of the Seahawks in the 2009 NFL Draft. He was considered the "safe pick" of the year. He's retired from the NFL right now. I like to believe his friends gave him a wide berth during the Super Bowl as he sat quietly snacking on chips and salsa while the Seahawks dominated. But if we're going to talk about Seahawks linebackers who were busts, we have to talk about the Boz, right? Though I stubbornly believe it was the injuries that cost him his career. And not our next guy, you know who. That's right. Jackson came and went way too quickly. He might have been the greatest player of all-time if not for one freak tackle against the Bengals. And is it weird that I will always fondly remember his last season as a designated hitter for the then-California Angels? That was like five team name changes ago. Speaking of L.A. legends, some might remember Maddox as the short-lived Steelers quarterback who gave way to Ben Roethlisberger. But to us in Southern California, he will be forever remembered the guy who delivered L.A. its last professional football championship as a member of the Los Angeles Xtreme. But speaking of the Steelers, whatever happened to them? They are now this .500 football team and have been replaced by the Pirates as the go-to team in the Three Rivers region. You've played with my heart too much, Rams. Until I'm standing on the sideline of the Rose Bowl watching the kickoff, I just refuse to believe it will ever happen. Wait, are we really trying to decide who are the elite quarterbacks here on NFL.com? We should just stop this after Eli and Flacco ruined it. Whatever happened to this guy? All right, only kidding. But seriously, what happened to this guy? He won a playoff game for crying out loud. I mean, Derek Anderson is still in the league, and we can't find a spot for a first-round pick in the 2010 NFL Draft?